Funerary (cinerary) vase carved with a frieze of the labours of Hercules (Herakles). You are here: CollectionsOnline / Funerary (cinerary) vase carved with a frieze of the labours of Hercules (Herakles). On the bowl, between a wave pattern within two fillets above, and a double wreathed oak and ivy-leaf encirclement about the bottom of the bowl (which the restorer has mostly represented as oak leaves and acorns), is a continuous frieze of the Labours of Hercules, broken only by the elaborate handles on opposite sides. The frieze is composed of mainly 'restored' sections patched into the genuinely antique bowl-bottom; and the whole is heavily reworked. 1. Herakles and the Horses of the Thracian Diomedes. 2. Herakles and the Boar of Erymanthus. 3. Herakles and the Nemean Lion. 4. Herakles and the Lernan Hydra. 5. Herakles and the Hind of Ceryneia. 6. Herakles and the Birds of Stymphalus. 7. Herakles and the Cretan Bull. 8. Herakles in combat with Geryon. 9. Herakles dragging an Amazon along the ground. 10. Herakles cleansing the Augean Stables. 11. Herakles gathering the Apples of the Hesperides. 12. (at the end of the reverse side), Herakles dragging the Three-Headed dog Cerberus from Hades [the Underworld](?). The frieze with the labours and the composition of the vase as a whole is similar to that drawn and engraved by Piranesi (Vasi Candelabri Cippi, plate 75), although some details including the order of the Labours are somewhat different. The inscription on Piranesi's plate records that the vase belongs to General Schouvaloff. The Labours of Herakles (or Hercules), as shown on this vase, are based on the ancient Greek statues by Lysippos and anticipate similar, deeply two-dimensional representations on late Antonine through third century sarcophagi originating in the workshops of western and southwestern Asia Minor. For a general study of the group of statues by Lysippos and how these were transformed into various expressions of later Hellenistic and Graeco-Roman art, and the sculptures they inspired, see E.P. Loeffler, 'Lysippos' Labors of Herakles,' in Marsyas VI, 1954, pp.8-24. For such sarcophagi, with statuesque Labours, see N. Firatli, in Mélanges Mansel II, Ankara 1974, p.919, pl.329a (a large fragment from Nicaea); Y. Boysal, Anadolu Arastirmavi (Anatolian Researches) (Honorary Volume for Helmuth Theodor Bossert), Istanbul 1965, pp.101-110, pls.XV-XIX (the complete sarcophagus from Pappa Tiberiopolis (near Beysehir, Turkey), in Konya Archaeological Museum (Turkey) no.1002). This last sarcophagus manages to show all the Labours in the delightfully attenuated style of proto-Late Antique Asia Minor (second half of the 3rd century AD); the Soane urn follows the fourth century BC styles of vigorous Attic art in the late Hellenistic period or in the Graeco-Roman commercial phase known as Neo-Attic. 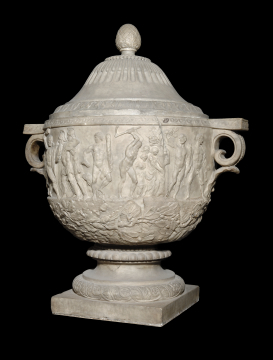 Purchased by John Soane at the Robert Adam Sale, 22 May 1818, Lot. 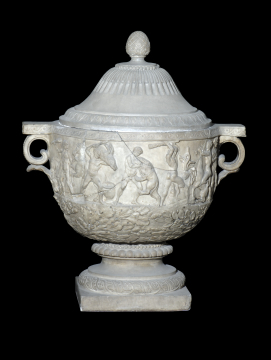 97, A larger marble vase & cover, surrounded with figures in bas relief representing the labours of Hercules, £16.5.6. Description of Sir John Soane's Museum, 1930, p. 84, fig. 50; p. 82, fig. 48 (lower left), p. 83, fig. 49 (centre).